Beautifully personalised Rocks Whisky Glasses make for a practical and unique gift for any receiver. Have yours engraved with your very own message to make this gift extra special! The classic design and clean look make it the perfect choice for any occasion. The glass holds 11oz and stands 8.7cm tall x 8.2cm diameter at top and 7.7cm diameter at base. 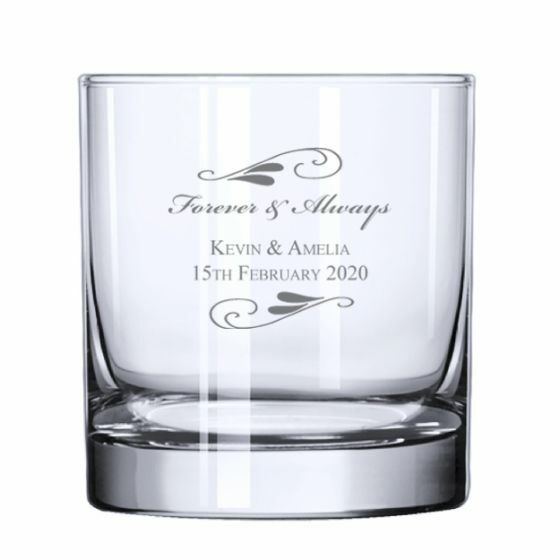 The glass can be personalized with white etching for use long after the wedding reception or party. - Please allow at least 3 days for personalisation. Please allow the normal personalisation time and delivery time for the item to be shipped.